Celebrity Cruises are world renowned for their luxurious ships & perfect service. 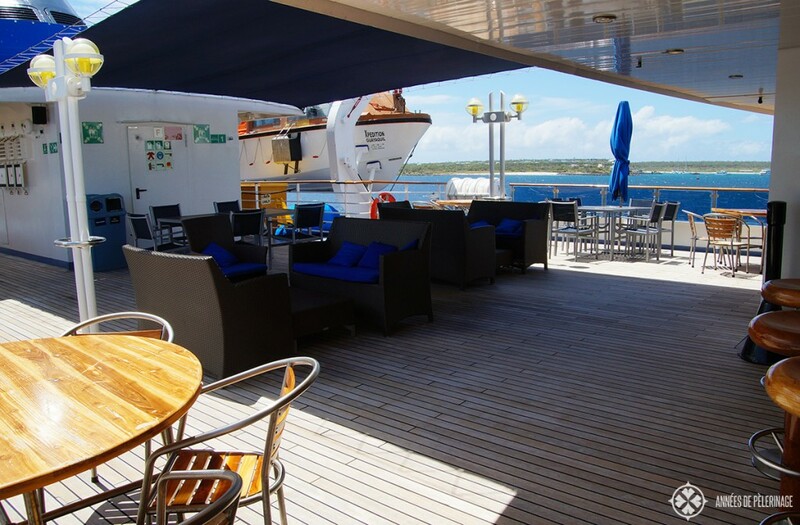 They are frequently ranking among the best cruise ships in the world and they certainly hold the title of the best luxury cruise ship touring the Galapagos islands. 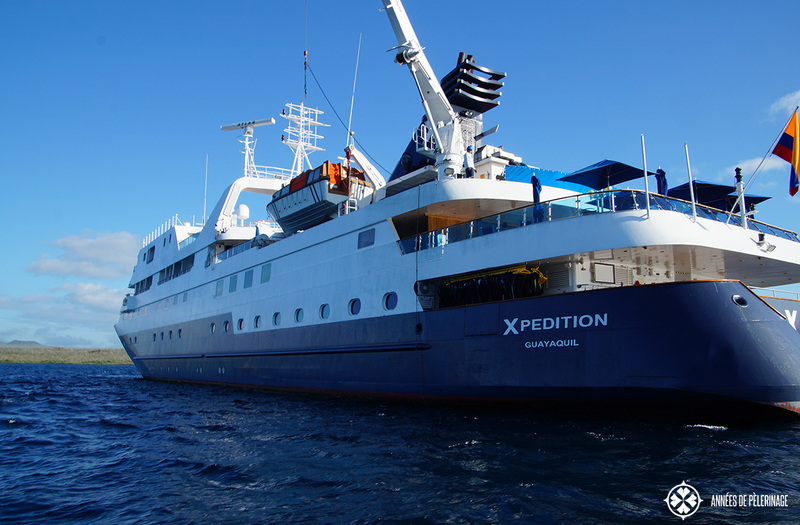 But can the Celebrity Xpedition stand up to the fame? Here is my honest review. 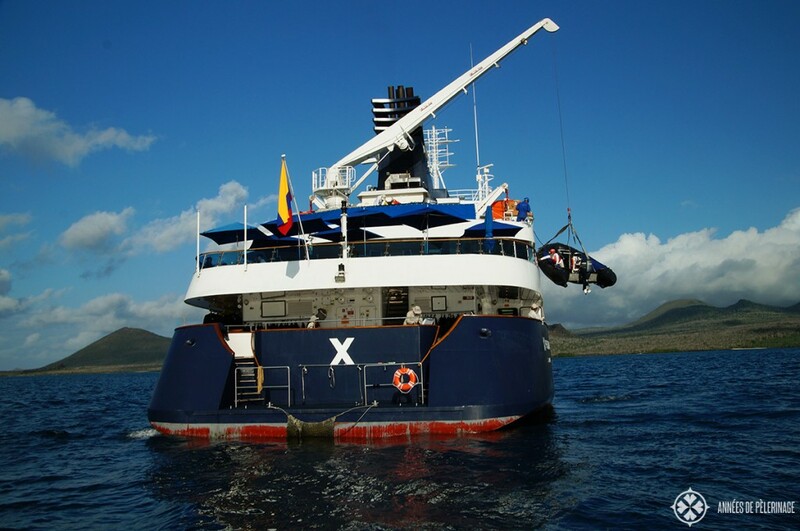 The Celebrity Xpedition can be classified as a mega yacht and not so much a full-fledged cruise ship. All in all, it has a capacity for 100 guests at a length of 296 feet. Built in 2004 the beauty shows some age, but does so in a more than regal fashion (check out the official website for more details). Only a handful of licensed ships are allowed to cruise the national park, and none of them are big cruise ships. I can only speak for myself, but the Celebrity Xpedition seemed to offer the best package, finding the perfect mix between luxury and exploration. 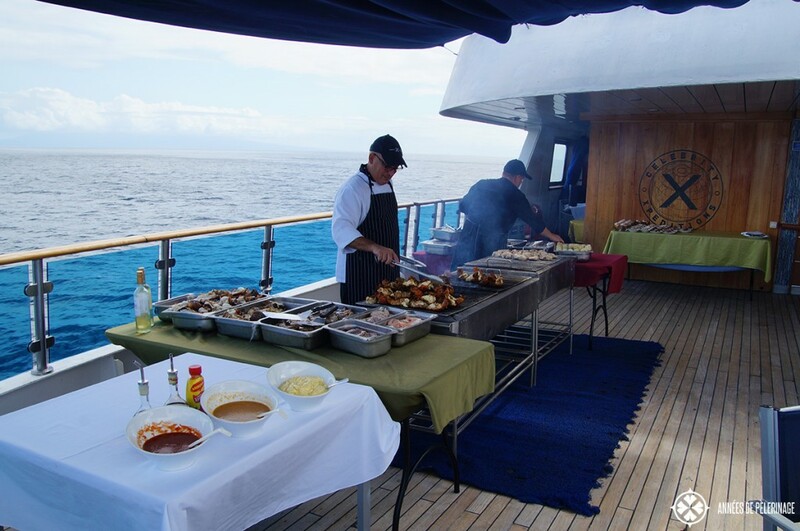 Silversea is also running a yacht cruising the Galapagos, and would be the only true luxury alternative. The Xpedition is an all-inclusive ship (even down to the mini bar in your room), including all alcoholic and non-alcoholic beverages (except champagne). There are three public decks. The most spectacular one is certainly the upper deck, where you will find a hot tub, sun beds, an exercise room, and a massage room. 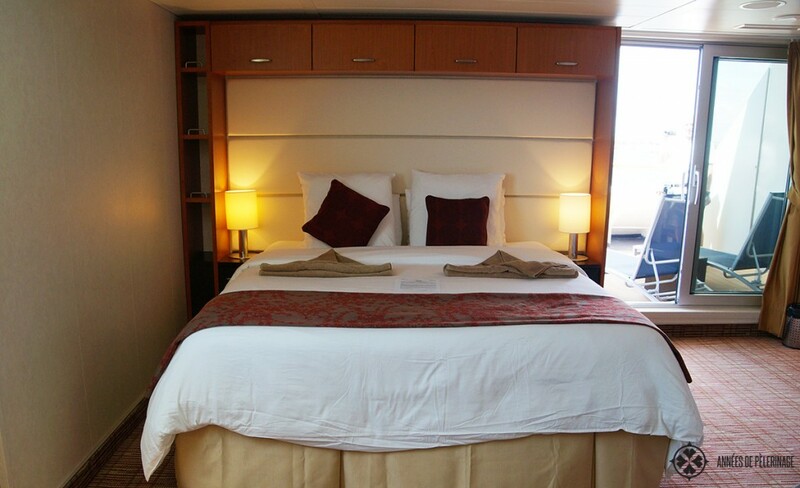 The most exclusive staterooms are located here as well. Down below you will find a bar and a restaurant (though the bar is mostly closed). The Celebrity Xpedition has a lot of different types of staterooms, none of them small and most of them actually featuring balconies. 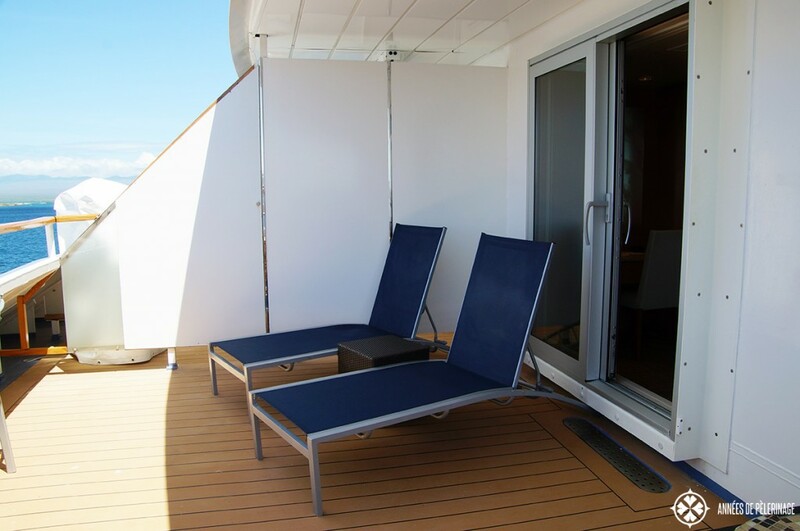 As you are not spending too much time on the ship or in your rooms, having one is not a necessity. It sure feels lovely to breathe in the outstanding atmosphere in a more private setting, but the public decks are not exactly crowded either. I personally took the penthouse suite, which is the biggest suite on board (460 square feet). 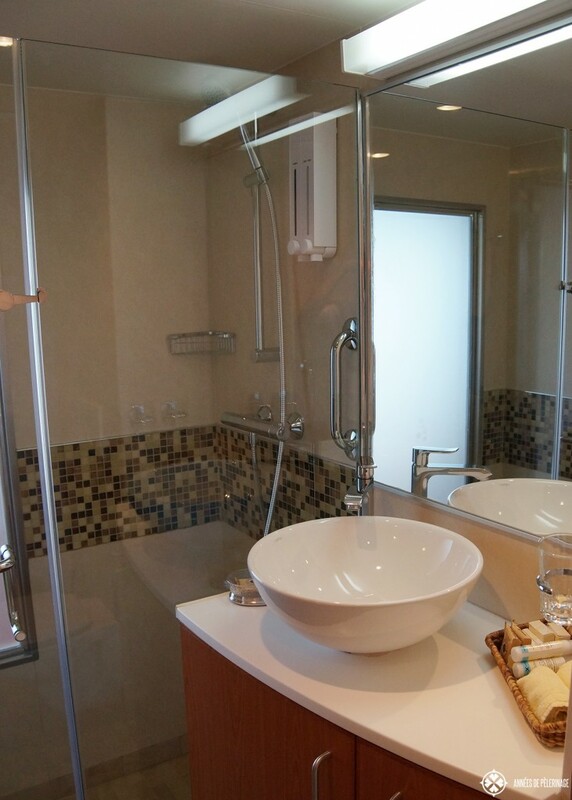 It features a big sitting area, two bath rooms, a huge veranda (150 square feet) and its own outdoor Jacuzzi. Since the veranda is actually looking forward on the port side of the mega yacht, this is probably the most beautiful place to enjoy the scenery. 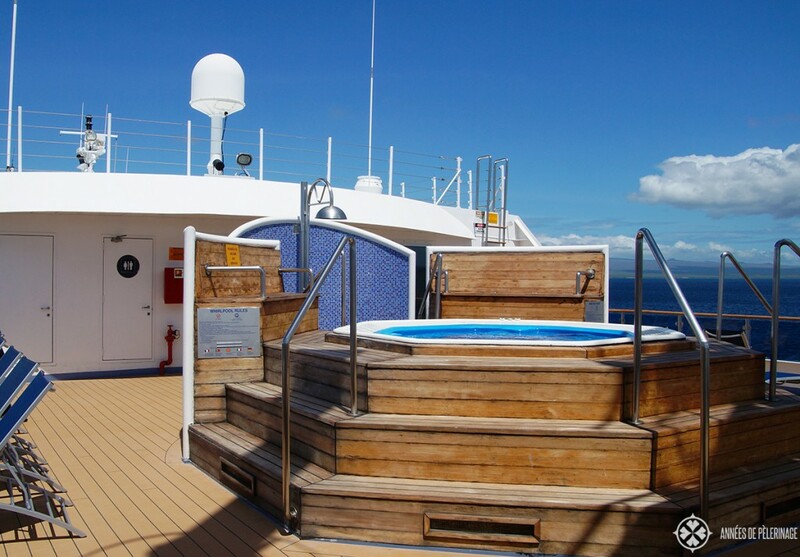 Not even the captain has such a wonderful view – it is also the quietest part of the ship (all public decks are aft). 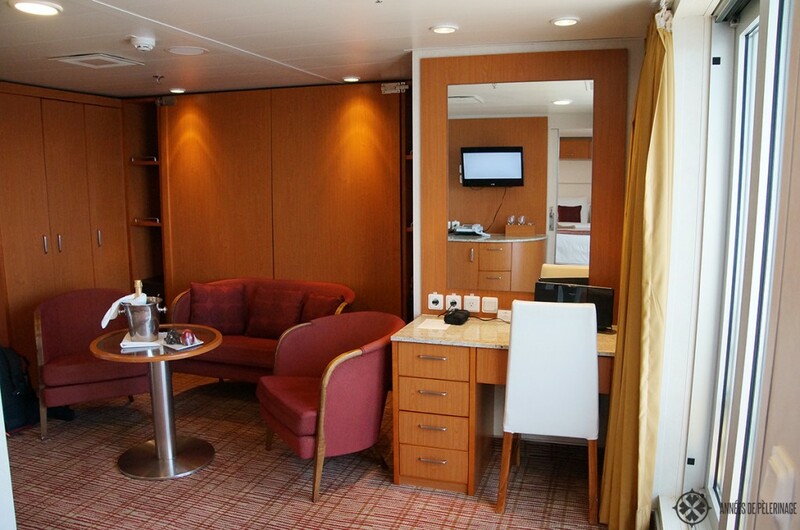 From what I’ve seen (friends of mine had an Xpedition suite), all the other staterooms are equally well appointed. The beds were fantastic and the bathrooms were small, but featuring beautiful standard fixtures (so no caravan style plumbing unit). Being the interior design fanatic I am, I couldn’t say I really liked the furniture. It felt a bit old-fashioned and unsophisticated. For an expedition ship (and that’s what it really is), the standard was beyond high. Still I believe an overhaul is due within the next 5 years. There was enough space to store my luggage, though I have to stress that I was using up all the space of my suite alone. Now I personally never travel light, because I feel this is a waste of opportunities. Still, if you intend to book a standard stateroom, I would recommend packing wisely. The closets are not big enough to handle two 23kg suite cases, but neither do you need that much for the short one week cruise. Small as the Celebrity Xpedition is, there are only two restaurants aboard. There is the main restaurant called “Darwin’s Restaurant” and there is the Beagle Grill on one of the lower decks where you’ll eat outside. Both restaurants really did their best to cater to the needs of the different types of travelers. Calling it Michelin star quality would be a far fetch. All things considered, it was definitely edible, which, coming from my mouth, would actually be a huge praise for cruise ship cuisine. It all tastes very American though. Lunch was buffet style while dinner was a fixed menu (though with plenty of different choices for each course). The wine was abysmal, but that’s what you have to expect on an all-inclusive-ship. The drinks had way to much ice (90 percent of the guests are American’s), but on the second day they already knew my preferences. They even brought up some better wine, after I complained, but I guess not everyone is a wine affectionate, so I am more than sure the wine is better than on 90% of all other cruises and mostly everyone will like it. There is also a bar (again all drinks are complimentary) in the so-called Discovery Lounge. This is where lectures and evening entertainment are taking place. The bar staff is friendly, the cocktails okay, though you shouldn’t order to exotic drinks. The Celebrity styles itself an expedition ship, and it surely delivers on that promise. Each day there will be several landings with different options. Usually, there is a long walk and a short walk, where the latter is tailored to the needs of not as fit passengers. 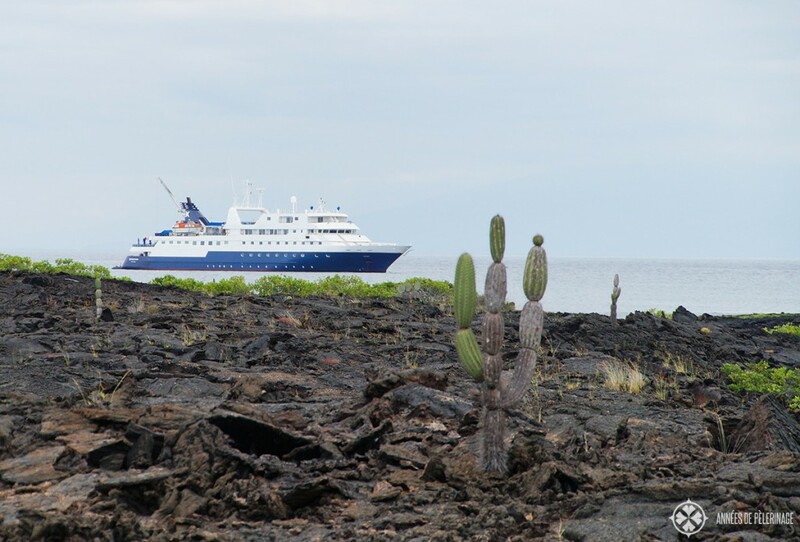 These landings are always within the confines of the Galapagos national park, so every landing boat will consist of a maximum of 15 passengers and one officially licensed natural park guide (called ‘naturalist’). 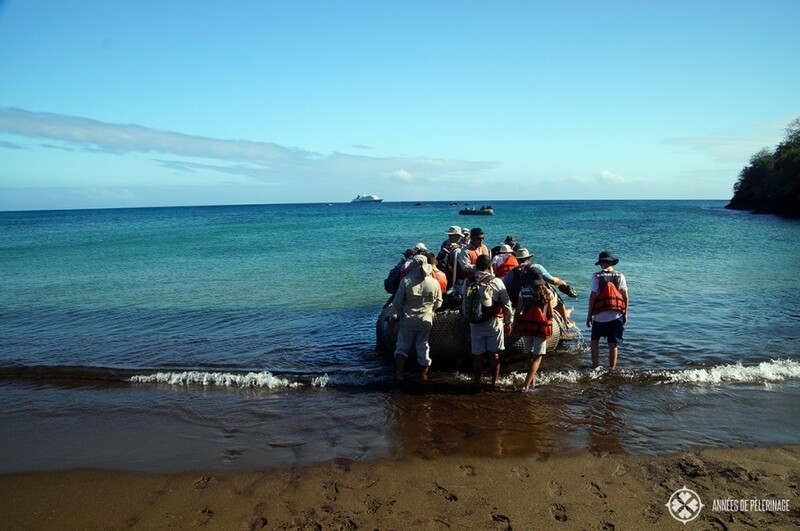 You will not be permitted to walk around on your own or leave the group, to protect the fragile ecosystem of the Galapagos Islands. Most of the guides know the place very well and are able to explain all the minutiae. As you will not be with the same guide throughout the cruise, you will notice differences, though. As required by law, they are all locals from the Galapagos. But fear not, they all speak English fluently. The groups for the day are often very mixed. As I was almost the youngest passenger on board, I sometimes felt like we could walk a bit faster. Some explanations were a bit long and boring, but then again I did a lot of research in advance and heard it all before. Each evening there will be extensive lectures helping you with deciding on which landing to do on the next day. These lectures are very, very detailed. So you’ll see pictures of the terrain you will be facing, detailed information on the wildlife you will be seeing and general information on the various islands you will be landing on. After these lectures, you have to sign up for the landings you want to do. Important note: A lot of the landings will be wet, meaning you have to disembark right from the landing boat into the surf. The crew will help you, and it is by no means dangerous, but I am not sure my 83-year-old grandma would be able to do it. The terrain is mostly volcanic rock and/or sand. You will have to be considerable fit and surefooted (though they provide walking sticks) to do these landings. This is an expedition ship and the cruise is absolutely not made for handicapped people. If you are unsure, whether you can handle it, I recommend contacting Celebrity directly. I am sure they will be able to answer you truthfully. I really have to stress that the whole crew was more than friendly and competent. It almost felt like family, so intimate was the whole atmosphere. We had our own room maid, who was responsible for keeping our suite always clean, always providing us with fresh snacks & drinks and helping us along with laundry and so on. I really have to stress that she did an amazing job. Mind you, being on (wet) landings twice a day really didn’t help the overall cleanliness of our rooms. No matter how careful you are, sand always creeps in. But no matter what kind of “mess” we left behind, everything was back to pristine once we returned. The high standard applied to the rest of the crew as well, though nothing in their demeanor was posh or overly formal. The Celebrity Xpedition is, as the name already indicates, an expedition ship. That being said, there really is no dress code whatsoever. Everyone is wearing functional clothes fit for the excursions. You can leave all your formal wear at home. Just take along two or three nice shirts and some long pants for dinner or any other occasion. All in all, you really should focusing on packing things to help you along on the landings & enhancing the general experience on land. This means fast drying clothes, lots of sun protection, good photo gear, and comfortable shoes. 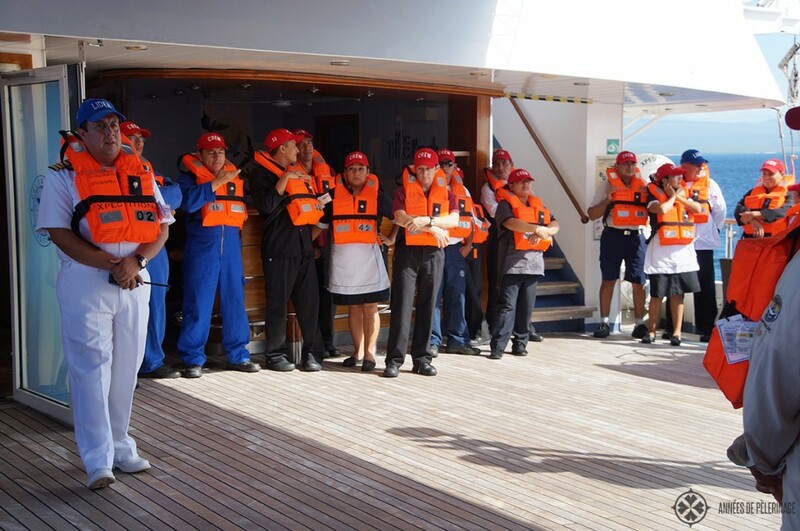 Snorkeling gear and wet suites are provided by the ship, so no need to bring these along. I compiled a more extensive packing list for the Galapagos Islands you should definitely check out. I couldn’t say I didn’t like my stay onboard of the Celebrity Xpedition. I usually am not a big fan of cruise ships (to say the least), but I thoroughly enjoyed every minute. The crew was so helpful and friendly. When my private Jacuzzi broke down, they repaired on the same day. After those 7 days on the sea, it almost felt like leaving a family. 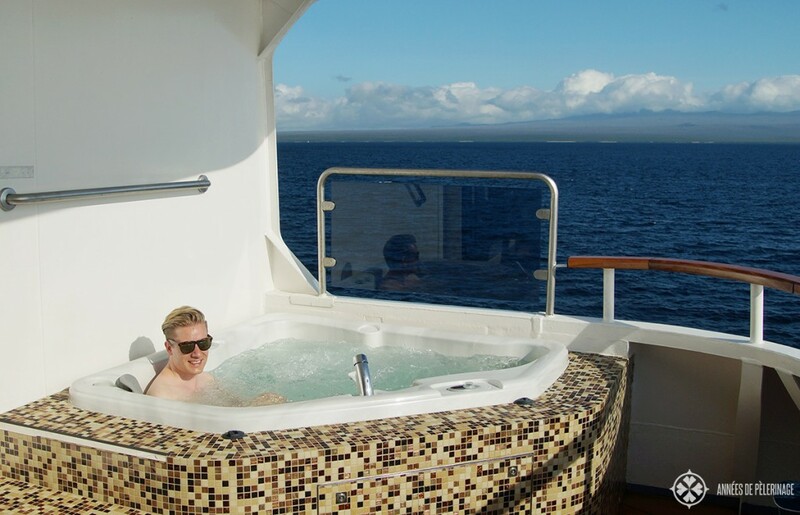 Now mind you, this is not your average luxury cruise, where you will get pampered morning to evening. 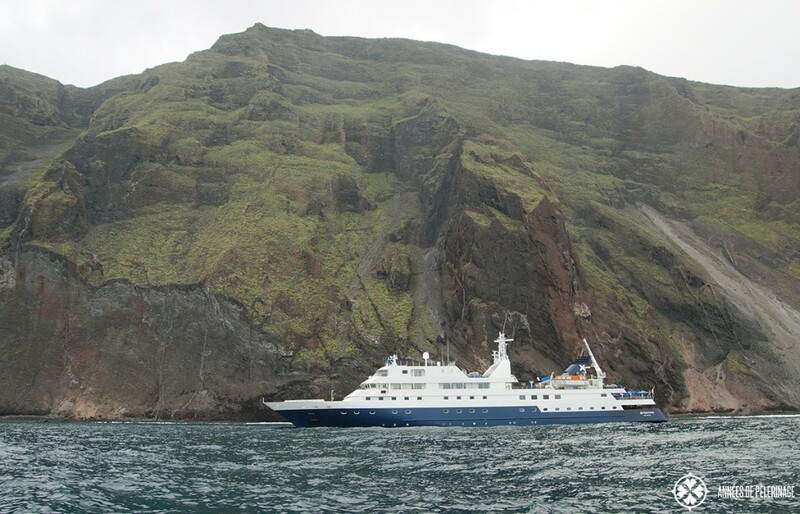 It is an expedition cruise, so spectacular wildlife and impressive nature is the reason why you are paying a premium. I already mentioned that I was more or less the youngest passenger. 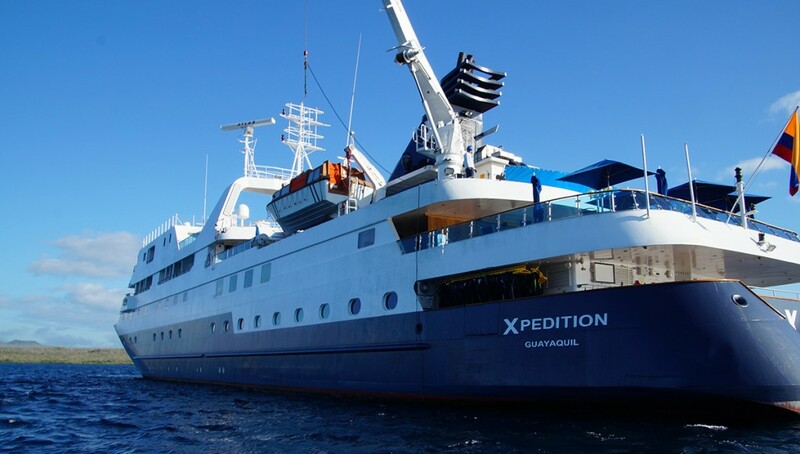 Since the Celebrity Xpedition is not exactly cheap (you could actually call it outrageously expensive), young people apparently option for cheaper and less luxurious alternatives. My guess would be that the average passenger was around 55 years old. Since I had my private little domain and am generally very introspective, I did not mind that fact at all. Apart from the hefty price tag I can recommend this cruise from the bottom of the heart. 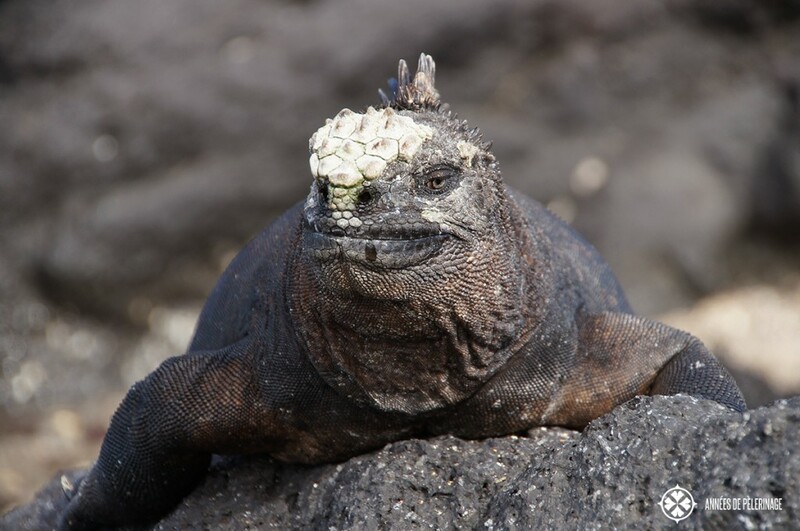 The things you will see on this Galapagos cruise will be memories to last a lifetime. Hope this Celebrity Xpedition review was helpful. If you got any questions, make sure to ask them in the comments below. Or share this article to support my work! 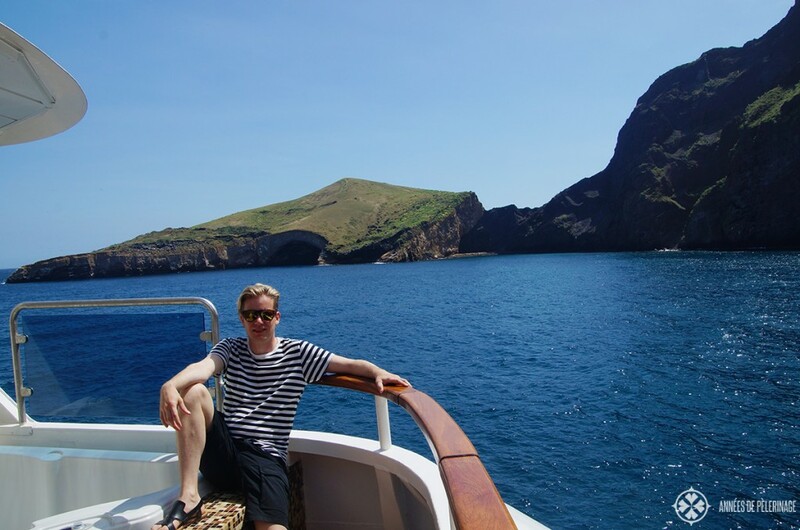 Disclaimer: I had no association with Celebrity Cruises whatsoever when writing this review. My opinions are my own, and so was the money that paid for the cruise. In 2015 I stayed 6 nights on this luxury cruise ship in their penthouse suite. Looks like a great expedition cruise, and all inclusive with the drinks would be a huge bonus to some people because that is not the norm on Celebrity’s other ships. 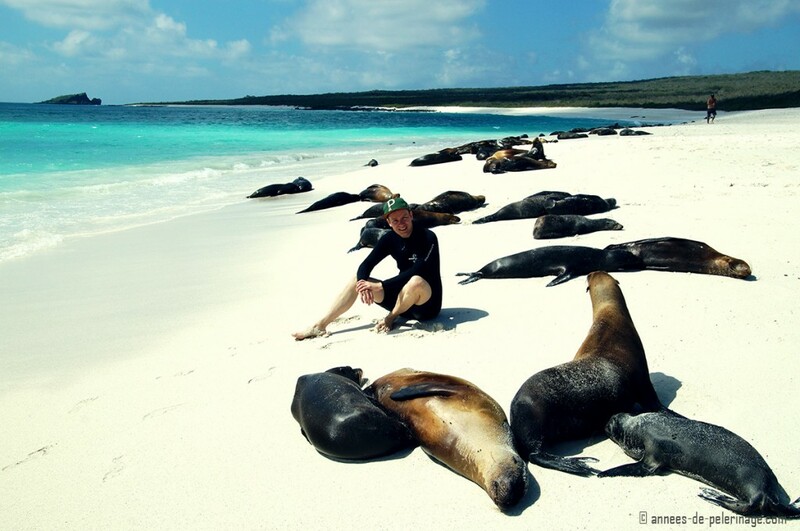 Nice photos around the Galapagos. Thanks for sharing! Just came across your good review. One of the few that is so detailed with relevant information.